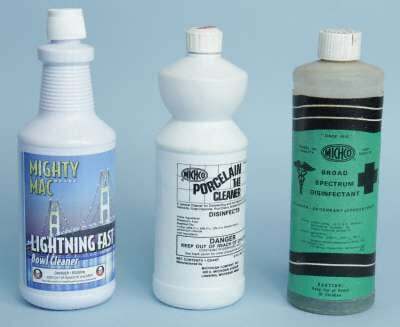 Michigan Company Inc. (Michco) is a family run business serving the central Michigan region for over 94 years. 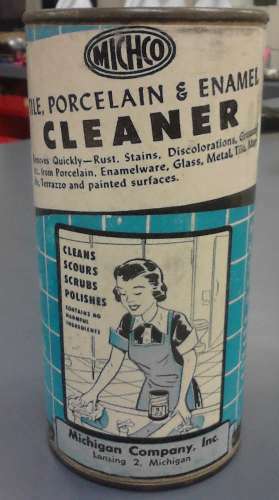 Recently a customer found this can of Enamel Cleaner from the 1940's in an antique shop and sent a photo of it to us. I guess it is fair enough to say you're an old company if your products are being sold in antique shops. Our motto: "You are not only a customer, but also a friend" has helped us grow and prosper. With both a commercial store and national distribution centers, Michco can meet the needs of any type of commercial client. Michco offers a complete line of commercial quality cleaning products and equipment from some of the most innovative manufacturers in the industry. Featuring leaders like Betco, Clarke, Minuteman, ProTeam, Deb SBS, Mighty Mac, SCA Paper, Kimberly Clark, just to name a few of over 200 manufacturers we distribute. We stock 1,000's of parts & brushes, offer over 3,000 manuals for nearly every major machine line, and offer on line access to over 450,000 parts from 7 major machine manufacturers. All equipment is service with a team of factory trained service technicians supported by on site parts inventory. Need a part tomorrow? No problem, it is just a phone call away. Come find out why the Fortune 500, 100's of major universities and colleges, over 2,000 school districts, and 16,000+ janitorial companies nationwide count on Michco to keep their facilities clean and profits coming. Our constantly upgraded computer networks & hardware affords us with the necessary technology to provide our customers with superior service. Custom programmed software keeps track of your order and monitors all tracking of your materials. For our commercial customers we track all purchases and can provide detailed departmentalized usage reports upon request. Our account representatives offer consultation services on ways to reduce your total facilities maintenance and operation costs through focusing on procurement, training, usage, disposal, and safety including order consolidation and single source purchasing strategies. Our fleet of delivery trucks (and yes we wish we still had the Ford models, but we use more fuel efficient ones now) cover the entire Mid-Michigan area with deliveries available on scheduled routes, LTL and FedEx small package services are utilized for other areas. We ship from multiple locates around the US. Prompt next business day delivery is possible if requested and orders are received prior to 3:00 PM EST for all cataloged items. For special orders, deliveries are generally made within days. And we've even used chartered aircraft to expedite critical shipments. And don't forget, you can browse and shop over 7,000 janitorial specific items at our on-line store. Make sure you check out the cleaning gizmo and gadget center where you'll find 500 of the hard to find little helpers to make your life easier. Purchasing convenience direct from your PC! Michco was incorporated in 1922 servicing primarily school's needs of the time. Using Ford Model "T"s and "A"'s Michco delivered to surrounding school districts selling basic school supplies like pencils, desks, chairs, and eventually cleaning supplies as school districts became larger. Our first manufactured product was sweeping compound made specifically at the request of a school district we were servicing at the time. 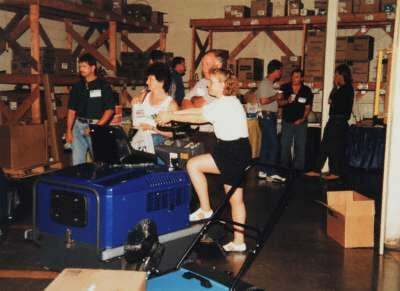 As Michco grew, emphasis was placed on expanding into industrial markets and other commercial facilities. 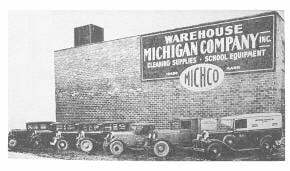 Michco's first real commercial building (shown in photo with Ford vehicles) was located on Grand Ave downtown Lansing, MI. This building was torn down for expansion of the Lansing Community College. We moved into 400 E. Michigan Ave during the 1950's. 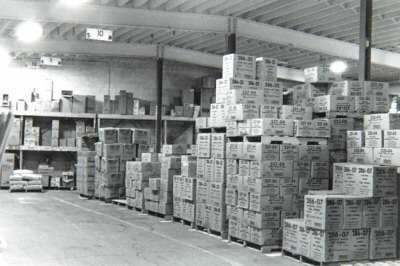 Most all of the products Michco sold at this time were manufactured in the lower warehouse on 400 E. Michigan Ave., Lansing Michigan (Two of these products are pictured at right). This location no longer exists; it was demolished in the mid 1980's to provide better street access for the Impression 5 Museum shortly after we moved to our current location. In 1964 DeVere Curtiss purchased The Michigan Company Incorporated from then owner & founder Jack Crist to start the Curtiss Family's involvement. Mr. Curtiss ran the company with his two sons until 1979 when he retired to warmer places in Florida. During this time Michco developed into a corporate entity where sales outpaced manufacturing capacity and management made a strategic decision to concentrate on distribution rather than the dual role of both manufacturing and distribution. 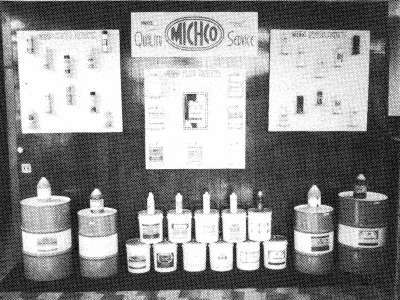 Most all products were contracted for production and Michco manufacturing was limited to a few key products. 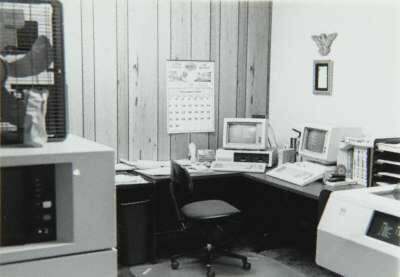 In 1978 Michco purchased one of the first production models of the new personal computer from the Tandy Computer Division called the T.R.S.-80 Model I. This was the first commercial installation this side of the Mississippi River. Mr. Curtiss' background in insurance taught him the value of information gained from statistical data about products and trends which was used in everything from inventory to sales forecasting. "Anyone can move a box with stuff in it; the winners know more about what they are doing and where to focus resources." - Mr. Curtiss. From the beginning of the micro computer revolution Michco strives to bring technology into the facility maintenance area and use technology to reduce operational costs. 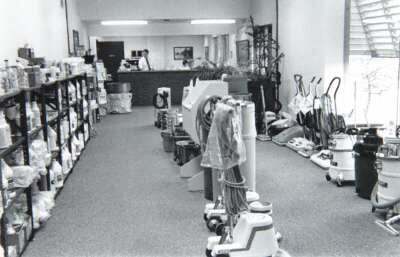 With sales growth comes expansion and in 1981 our current facility was purchased and remodeled. We moved from 400 E. Michigan Ave. to 2011 N. High Street. Our current facility is 25,000 square feet with 5000 square feet of office space. We really thought we had a large building in 1981. Today, continued sales growth has consumed all available floor space and in nearly all areas between the floor and ceiling too. In 1983 an IBM System 34 was selected to replace the aging Ohio Scientific Challenger personal computer. This investment marked the beginning of multi-user departmental usage bringing the computer into real time operations. A strong focus was placed on software development geared toward placing technology in the hands of individual workers rather than the "high tech staff" in the back room. We use technology extensively to promote communication with our customers via faxes, emails, and smart phone devices to speed communications. With our investment in distribution technology, we provide specialized custom services for our customer's needs and each account manager is completely automated with in the field access to our network of information. Customers around the US can now access this information on line at www.Michco.com. 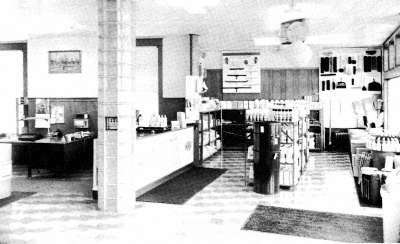 As the third generation of Curtiss family members continue the tradition started in 1922, we place great emphasis on satisfying our customers with one stop shopping. Our staff no longer thinks about supplying cleaning materials, but rather every product you may need to maintain and operate a facility. We stock 32,000 items with 44 shipping points in the U.S. that supply every little detail like coffee, copy paper, pencils, toner, note pads, light bulbs, signs, fire equipment, clocks, computer equipment, fax supplies, furniture, packaging materials, mail room materials, ..... and the cleaning materials like toilet paper, bowl cleaners, degreasers, vehicle wash, floor finishes, equipment, disinfectants, glass cleaners, polishes, etc... Our current capabilities include extensive computer abilities, custom web portals for training your users, bar coding for end users, web SDS's for most products, service for all commercial cleaning equipment, training on product use, motivational seminars, inventory control, on-line catalog search and order entry, and all backed by prompt delivery just to name a few. We would love the opportunity to show you how you can make your life simpler and more productive so you've got more time to do the fun things in life.